NetAcquire® Corporation announced today a new collection of universal I/O interface options for serial signal connections. These new I/O interfaces offer configurable signal levels and connectors, and enhance NetAcquire’s “connect anything to anything” interface approach. The flexibility to reduce the rack space needed to a bare minimum is now available. Chassis back panels can now be configured to match exact signaling needs, even in 2U form factors. The TTL-compatible, BNC I/O interface version includes highly optimized signal conditioning with tuned transmission line impedances. Input hysteresis retains signal integrity at edge frequencies in excess of 10 GHz. Faster system integration is achievable using newly available software-programmable line termination. Each channel can be individually set to quickly match a site’s existing cabling impedance, eliminating the signal integrity problems associated with fixed single value termination typical with some equipment. 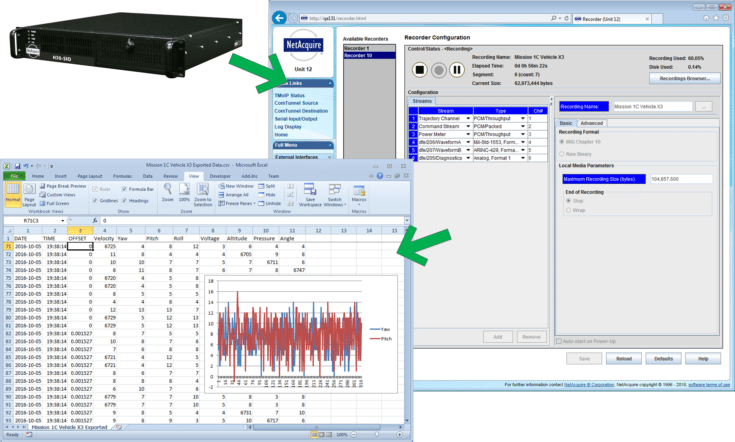 For the ANSI/TIA/EIA-422 (RS-422) I/O interface version, hysteresis has also been tuned for improved data reception. The standard five-signal serial port conforms to the EIA-530 pin-out for bi-directional data transfers at up to 40 Mbps. The NetAcquire-exclusive Enhanced Serial Port (ESP) adds an additional three signals for data qualification and transfer throttling while remaining backward compatible with the standard EIA-530 pin-out. The ANSI/TIA/EIA-644 (LVDS) I/O interface versions support either the standard EIA-530 or ESP signals while maintaining the higher signal integrity and lower power benefits of using LVDS signaling. These new universal I/O interfaces all have ESD protection, mis-wiring protection, and at-a-glance Rx and Tx channel status indicators next to their connectors.